Construction of Carr Field Municipal Airport near Lake Nasworthy began in 1940, but was not yet completed by the time the Japanese attacked Pearl Harbor in December 1941. San Angelo immediately began successful negotiations with the military to convert the airfield into an Army Air Forces bombardier training base. Military construction crews took over the job of completing the airport in May 1942. 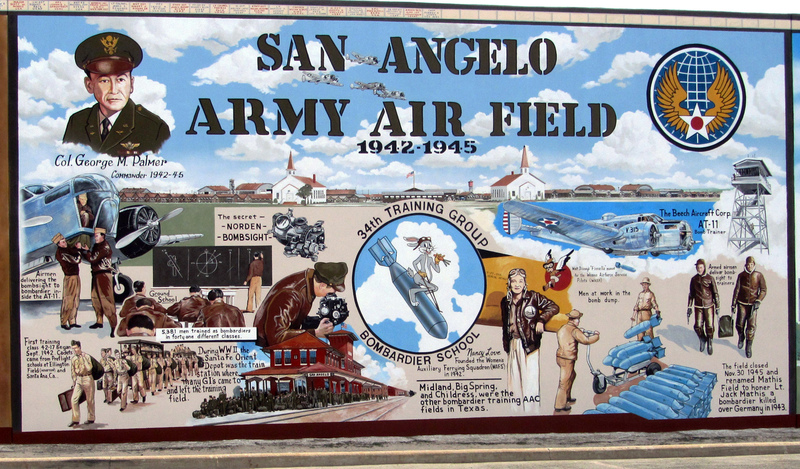 The San Angelo Army Air Field was activated on June 1, 1942, under the jurisdiction of the Army Air Forces Training Command. 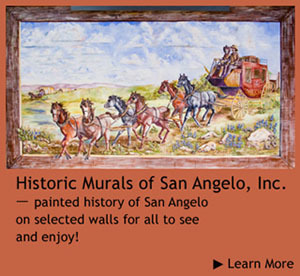 The hangars, barracks, warehouses, hospitals, dental clinics, dining halls, chapels and maintenance shops represented in this mural were mostly constructed of wood, concrete, brick and gypsum board. A modified 20th Army Air Forces emblem is painted in the upper-right corner of the mural. The buildings took some months to finish, so it wasn't until Jan. 8, 1943, that the 34th Flying Training Wing and the San Angelo Army Air Field Bombardier Training School were activated. The training school emblem, featuring the Warner Brothers' Bugs Bunny character riding astraddle a bomb, and the Army Air Force AT-11 advanced twin-engine training aircraft are featured in this mural. Col. George Palmer, the commander through the entire bombardier training period, and the Bugs Bunny logo are painted as they appear in the graduation program for the first class of bombardier graduates from the San Angelo school, Class 42-17. Records show that 5,381 men were trained here to be bombardiers. Bombardier trainees received about 35 flying hours of certification training with the Top Secret Norden bombsight. They practiced dropping at least 20 of the M38A2 inert 100-pound bombs per month, averaging about 200 practice bombs during their 260 total hours of training over the 12-to-18-week course. This mural shows the cadets arriving and departing at the Santa Fe Train Depot, studying in ground school classes, loading and unloading the bombsight from the aircraft, and aiming through the Norden eyepiece. The mural also depicts how the classified bombsight may have been secured to and from the aircraft by crewmembers under arms. There was already a shortage of pilots by the fall of 1942, so the Army Air Forces directed aviator Nancy Harkness Love to recruit women to ferry planes for the Air Transport Command. Twenty-five thousand women applied for the Women's Auxiliary Ferrying Squadron program and more than 1,100 women aviators flew every aircraft the USAAF had, including trainers, cargo planes, pursuers and bombers. Love is featured in this mural leaning against a transport aircraft with the Women Air Force Service Pilots logo featuring the Walt Disney gremlin, Fifinella, painted above her left shoulder. Soon after the end of WWII on Nov. 30, 1945, the flag over San Angelo Army Air Field was lowered for the last time. City officials eventually worked out a transfer deal that allowed them to reclaim the original Carr Field acreage, as well as almost all of the government-built buildings and airfield improvements. During this transition, the city renamed the airfield Mathis Field in honor of Lt. Jack Mathis, a bombardier who received the Medal of Honor posthumously for heroic actions during a mission over Germany in March 1943.